With the top three finishers all breaking the 8 hour mark it seemed reasonable to conclude that under good conditions Ironman Florida 2013 was a fast race, but what happens at the front of the race and what happens further back can be very different things. So when I retrieved and analysed the results this morning the picture was more mixed than I’d anticipated. 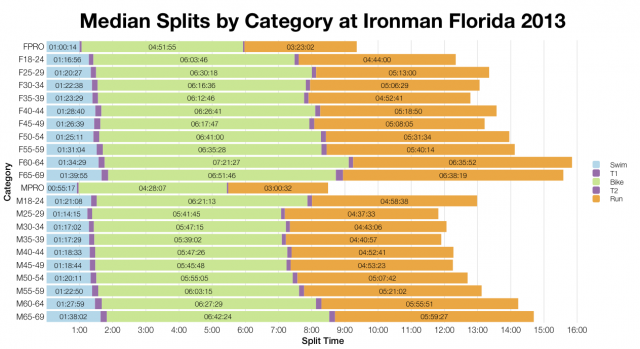 Ironman Florida is a fast race and certain elements – the bike – were particularly fast this year, but overall the results don’t deviate far from previous averages. The graph above allows a comparison of finisher’s split times from this year and past events (covering 2003-2012). 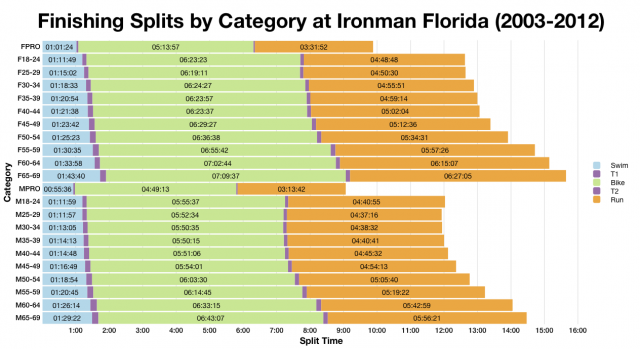 The broad patterns that can be seen are a slower swim, a faster bike and a slower run the overall result is finish times that are slightly heavier at the slow tail. At this high level I’d be inclined to say that as a whole Florida proved a little slower than usual. I can expand this comparison by considering the cumulative percentage of total finishers. In this new chart above black curves represents this cumulative percentage; as before the stepped histogram represents the percentages of finishers within each time frame. Dotted lines drop down from the curve show the 10th, 25th and 50th percentiles, indicating the cut off times for this proportion of the field (labelling will be improved for future versions). 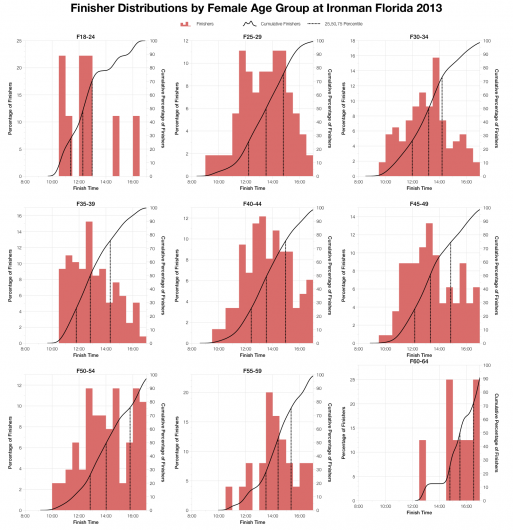 The 10th percentile times for 2013 are slower in the swim and noticeably faster for the bike while run and finish splits remain largely unchanged. 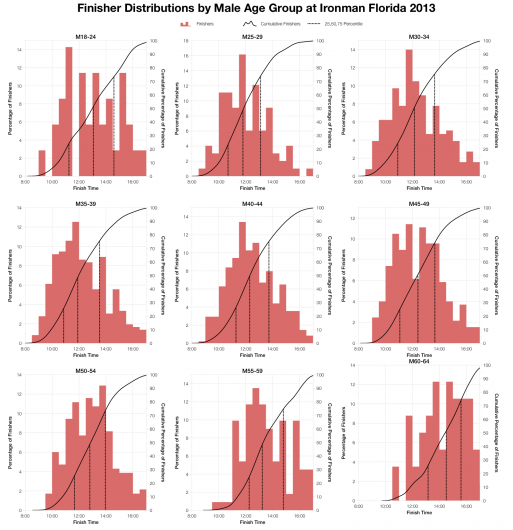 In contrast the 50th percentile times are more clearly slower in swim, run and finish while only fractionally faster on the bike. In effect the results this year have been spread wider with more fast finishes (perhaps due to the high numbers of pros), but equally a good weighting of slower finishers. Comparing the median splits from this year with previous years reflects this. 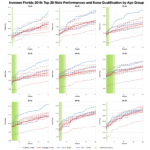 There may have been some fast athletes in Florida, but for the age group ranks only the bike is faster, swim, run and overall finish splits are slower. 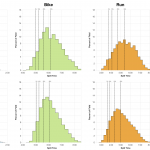 The pros however significantly outperformed previous averages in both bike and run; their inclusion in the previous split distributions probably helped add weight to the front end of the field. So how about some more new graphs? This time I’ve broken out finisher splits by age group to allow a closer look at how individual categories performed. Dotted lines here indicate the 25th, 50th and 75th percentile within that age group. 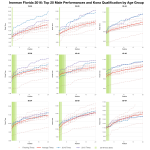 The professionals weren’t alone in delivering fast times as the top 20 performances in each age group demonstrate below. Kona slot allocations are taken from my previous post on past Ironman Florida results and predicted based on the published bib lists – actual numbers will likely vary depending on starters. For the most part, at least for those over 30, the front-of-pack were delivering faster than average times this year. A decent number of these being faster than previous bests for those positions (at least since 2003). The weight at the front of the results distribution was more than just a quality pro field. 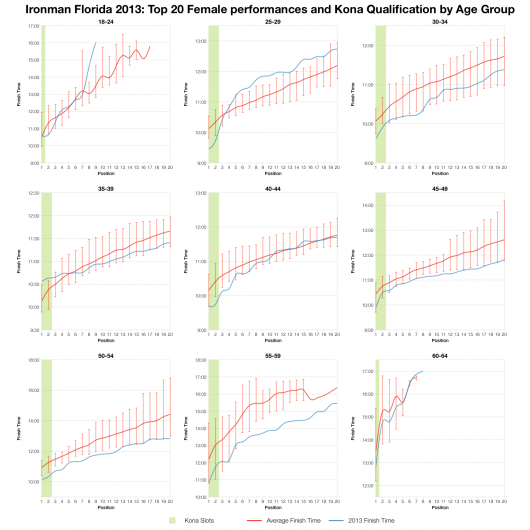 For Kona qualifiers it means times are typically coming in faster than the average too. Often my race analyses become condensed down to one of two descriptions: fast or slow. A broad oversimplification highlighted by these results – whether Ironman Florida was fast or slow largely depended on your perspective. For the pros and front-of-pack age groupers times were fast this year, but further back in the field the race stuck closer to past results. 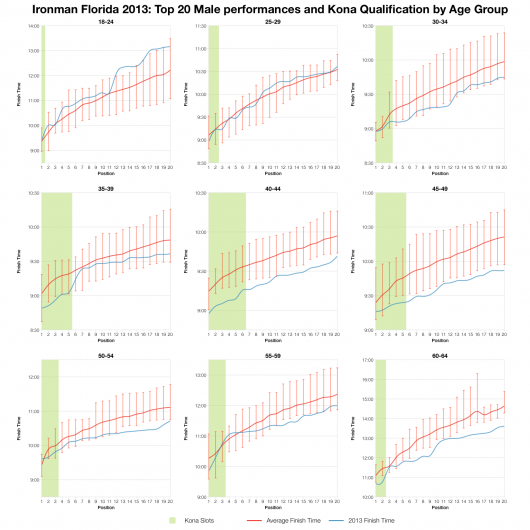 The competition for Kona slots was fast in a way the full spread of results doesn’t clearly suggest. 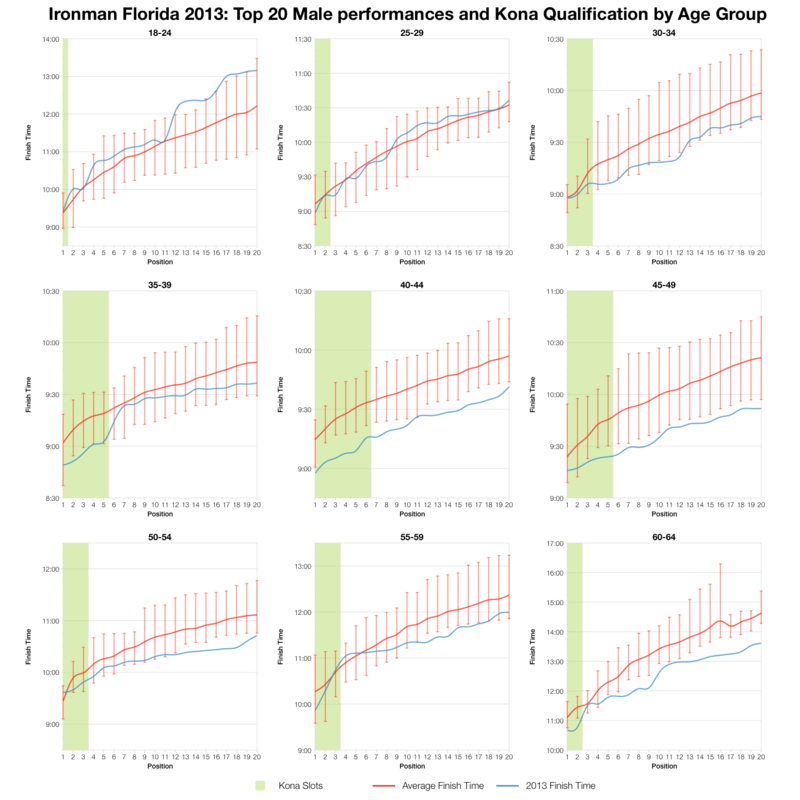 Finally for those who made it this far – I’ve uploaded a full set of results and splits from Ironman Florida 2013 to my Google Drive.